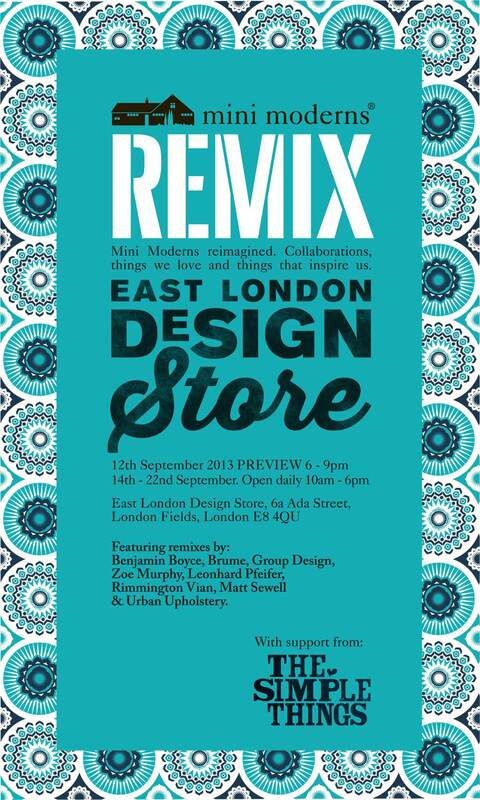 For the 2013 London Design Festival, Mini Moderns are curating a 2-week event, hosted by East London Design Store in their newly launched shop in London Fields, E8. The Remix project sees us team up with a select number of designers and artists, using our past collections as a basis for new work. The store will be filled with a diverse range of curated objects, furniture, lighting and ephemera that gives an insight into the Mini Moderns aesthetic and design process. The 2013 Remix project is based largely upon Mini Moderns’ Darjeeling wallpaper design, which was launched this year as part of the Buddha of Suburbia collection. Fittingly, since the collection celebrates a uniquely London cultural mash-up, we have given Remix collaborators free reign to reimagine the design on a piece of their choice. The project includes work by Zoe Murphy, Leonhard Pfeifer, Rimmington Vian, Urban Upholstery and Brume, as well as the launch of Mini Moderns’ first lighting collection, produced and designed in collaboration with Group Design. Further work comes from artist Matt Sewell and furniture maker Benjamin Boyce, who have both used the range of Mini Moderns Environmentally Friendly Paint as the basis for their response. Amongst the curated selection of products in-store, expect to find 60s and 70s film posters, jewellery, vintage games and home accessories, all selected by Keith Stephenson and Mark Hampshire of Mini Moderns, and East London Design Store founders, Della Tinsley and Gideon Cleary. The event runs throughout London Design Festival, with a launch evening on Thursday 12 September from 6pm, and a daytime customer event on Saturday 21 September, at which customers can meet the Mini Moderns design team.